Yes, Wells Fargo still does short sales, subject to its own unique procedures and rules. You can accomplish such a sale if you understand what those rules and procedures are. Wells Fargo has been around for more than 150 years, but the financial institution was not quick to jump on the short sale bandwagon. The bank figured out a way to deal with these sales a bit more slowly than other banks such as Bank of America—the first bank to adopt the Equator software system. This system is an online software program accessed by bank negotiators and real estate agents and lawyers. Alas, Wells Fargo no longer uses Equator, so approaching a short sale here can take a little more work. In the early days of short sales, from about 2005 to 2009, agents had to fax paperwork to Wells Fargo to do a short sale. This paperwork primarily consisted of a listing agreement, a hardship letter, tax returns, W-2s, 1099s, and bank statements. The chief complaint was the paperwork was often lost, shredded, or received by bank negotiators in pieces and incomplete packages. Then Wells Fargo joined Bank of America as the second bank to endorse Equator.com. This put a stop to missing paperwork when the Equator system was implemented and a few kinks were worked out. That turn of events didn't last long, however. Wells Fargo stopped processing short sales through Equator in 2015 after the short sale boom ended. Now all paperwork is back to being faxed. The average time frame to complete a Wells Fargo short sale is about three months from start to finish. You can probably expect your short sale to be approved in about six to eight weeks, then it will close 30 to 45 days later. This can depend on the investor, however, when an investor is involved. A super fast short sale processing time for Wells Fargo is two to four weeks, and this is also doable under some isolated circumstances. A traditional Wells Fargo short sale begins with an offer from a qualified buyer. The offer is ready to be submitted to Wells Fargo, along with the seller's completed short sale package, when the seller and buyer have agreed upon a purchase price and terms. The lender should acknowledge receipt of the package within about 48 hours. Wells Fargo indicates that it only reviews one offer at a time. The lender urges agents and buyers to submit their highest and best offers. What Should Be in the Short Sale Package? Wells Fargo wants to receive the listing agreement, an authorization letter, estimated HUD statement, and the purchase contract as part of the short sale package. It also requires a comparative market analysis for the property, as well as proof of loan approval. The lender requires proof of deposit if the purchase will be made in cash. A financial worksheet, hardship letter, two years' federal tax returns, two most recent pay stubs, and two most recent bank statements are also required. Proof of other income should be submitted if it comes from sources other than those represented by the pay stubs. Your agent or lawyer will initiate the short sale package, and Wells Fargo will then assign your agent tasks to complete, such as third-party authorization. Your agent will then fax all associated documents he's collected. A processor will review everything and assign the file to a negotiator. All parties will be asked to sign an arm's length affidavit, as well as other disclosures and agreements. An arm's length affidavit attests that the buyer is not anyone with whom the homeowner has a close relationship. Some supplemental documents might also be requested. 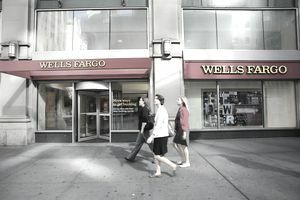 The file will be approved or denied by Wells Fargo if Wells Fargo has delegated authority. Otherwise, it will go to the investor for final approval. The ultimate decision rests with the investor in this case. The Wells Fargo short sale approval letter will be issued by the specific, applicable division of Wells Fargo. That approval letter might come from the Wells Fargo office in Des Moines if the loan is a home equity line of credit. Be sure to read the approval letter and ask a lawyer to interpret if you're the seller and you can't figure out whether deficiency rights are waived. A release of liability is the main reason most sellers opt to do a short sale. But the homeowner might owe a deficiency balance on the mortgage under some circumstances. Wells Fargo will give notice well in advance if this is the case but check with an attorney to be sure when you receive the letter if it's not stated explicitly. Wells Fargo pays all costs and fees at closing. Other types of mortgages can also be Wells Fargo short sales. For example, a loan originally held by World Savings would be a Wachovia short sale that now falls under the Wells Fargo umbrella. America's Servicing Company (ASC) is a division of Wells Fargo. America's Servicing Company services loans for other investors under ASC. A short sale can be a complicated transaction for both the buyer and the seller, particularly when there's more than one primary lien against the property. It's recommended that anyone considering such a transaction consult with a real estate professional or, ideally, with an attorney before getting too far into the process.